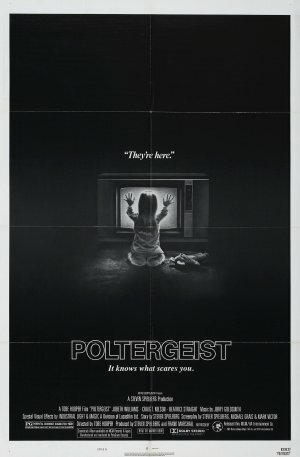 Was Poltergeist the trend setter for stereotypical horror films? As poltergeists start to haunt a family’s house, daughter Carol-Anne communicates with them however the family soon realise the spirits are not as harmless as they first seem. As far as horror films go, children seem to be less afraid of poltergeists than adults or dogs. Once again, this is the case in Poltergeist with 5 year old Carol Anne Freeling (Heather O’Rourke), the beacon between the living and the dead. The 5 year old gets captured and taken to the dead world by evil poltergeists, who are haunting the house, and the parents must work with a series of clairvoyant’s to get their little girl back. Throughout the first 30 minutes the film leaks small aspects of apparent poltergeist interference, for example the TV turning on and chairs moving all on their own. Many films often use slower opening scenes to build the story and grow characters, however this is not the case in Poltergeist, with parents quickly coming to terms with the strange occurrences, resulting in the “people in the TV” kidnapping the little girl. The lack of character depth with the first clairvoyant and her sidekicks prevents the viewer from believing she can save the family, leaving the pace and story to linger; however by filling these scenes with animation, the suspense to the finale increases, with the viewer guessing whether the parent’s task will be completed. Full marks for the horror factor with the killer clown, however this segment does slow the film unnecessarily. In the early 80′s, Poltergeist would have been at the height of film animation technology, however watching the film 30+ years later means it’s difficult to take the animation segments seriously. Compared to what horror offers now, skeletons falling out of coffins seems a little half-hearted but at least they don’t start fighting with a sword. If you enjoyed Poltergeist, you are likely to enjoy Insidious which is similar, but with a modern twist.